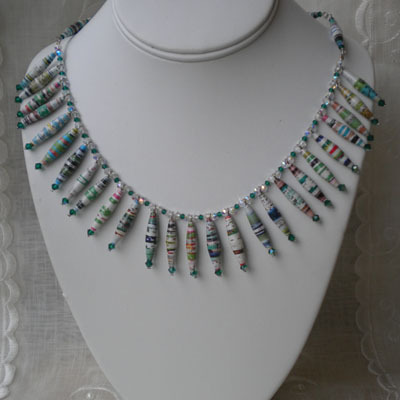 This necklace is one of our first paper beads jewelry, when we discovered mixing them with crystals! 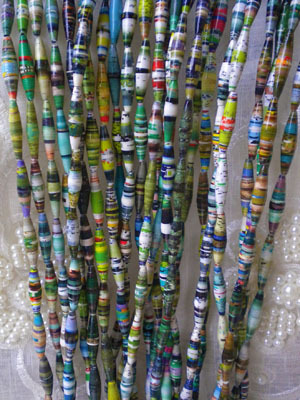 The Emerald Green Tone of the paper beads called for emerald green crystals. 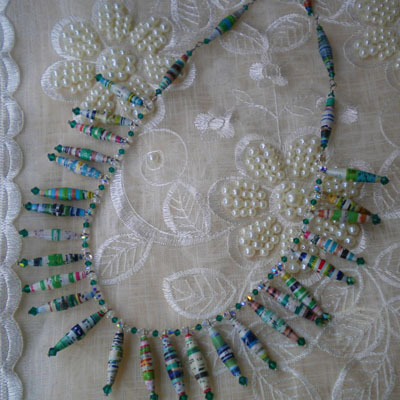 Each beads is strung on head pin, and hangs like charms on a beaded strand. The crystals made the whole piece more dressy but I wouldn’t hesistate to wear this with jeans and shirt. This certainly brings on the Holiday Spirit. Today, is our annual Holiday Stroll in downtown Glendora putting everybody in that Holidy mood. What a great holiday necklace!